There are things that float and carry stuff across the water called boats. A boat needs something to make it move. Some have paddles. I think that some of the popular small boats that might be easy to start with use paddles. And paddling seems safer and easier to understand - just push against the water - so let's assume boats that use paddles. What are the things I should know (or do, or get, etc.) before clumsily rushing into paddle boating? The very first thing the novice needs to know is where you want to go. There are several types of paddle (or Oar) powered boats. Each boat style has places they excel at and have shortcomings. Paddle Boat has center paddle (like an old steam paddle boat) that is powered by pedalling. It is only practical on small lakes with little wind. Row Boat there are several variations with the standard beginner model being 8 to 12 feet long and 4 to 5 feet at the beam (wide), with a mostly flat bottom. It is normally powered by one person using two oars, while sitting facing the aft (back) of the boat. It is the most stable of the one to three person paddle powered boats. It can handle rough open water, but is not as maneuverable as some other boats, and the rear facing seating makes a poor choice for rivers with rapids. Kayak a small (usually one person) boat powered by double bladed paddle. The boat of choice for the most extreme water, class 4 rapids and open ocean. There are several style variations. Training and Helmets are suggested for boaters on moving water. Also appropriate for calm water. Gondola Long narrow boat. Powered by a single paddle at the rear. For carrying passengers and/or freight on calm narrow waterways. Limited usage outside of special areas. Canoe Long narrow boat, powered by a single paddle with one blade, from a sitting or kneeling position. Normally holds 2+ passengers and gear. Appropriate for calm to moderately rough or white water. Combined with alcohol and no life jacket often in the news for fatal accidents. PaddleBoard Essentially a surfboard the you can sit or stand on and paddle. Currently popular on calm water. This is more of swimming accessory then a boat. If there are frothy white areas on the water (whitecaps) get back in your car and go home. These can be managed with training and experience but for the novice can be fatal. Lastly and most important always wear a life jacket (personal floatation device) from before you put the boat in the water until after you and the boat are out of the water. Not the answer you're looking for? Browse other questions tagged safety boats or ask your own question. What is a 'Whitecap' and why should I be concerned about boating in them? What do life jacket ratings mean (Type I, Type II, etc)? 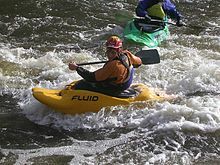 How common are tandem kayaks? How do I calculate how much lift an outrigger needs? What's the difference between an oar and a paddle? How do choices in design of a paddle-craft influence its handling characteristics? Does 'Single-oar sculling' have any use in recreational boating?